Brammo Blog: Bone Weary, But Home At Last. 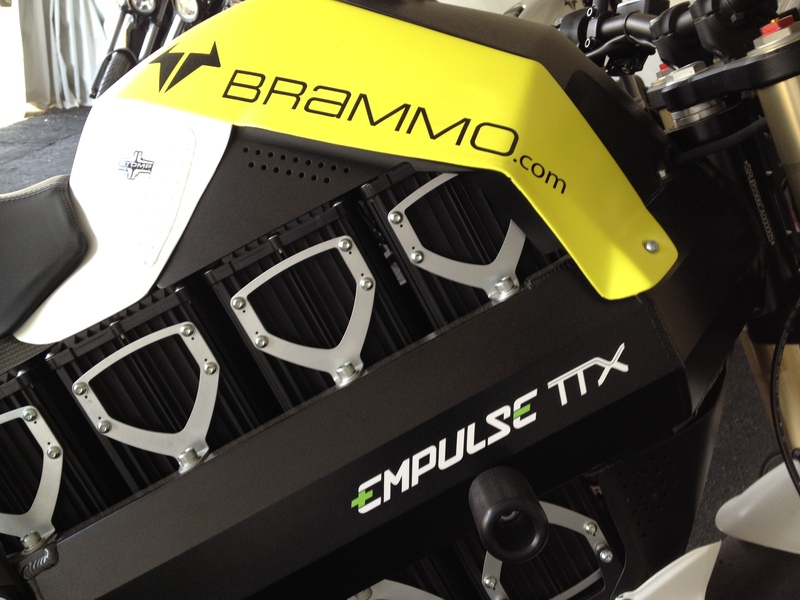 Blog 26: A short discussion on the Brammo Empulse TTX…and then off to bed. Tuesday to the following Tuesday. 2223 miles on the pick-up truck. About 150 miles on the Enertia. Over 100 of those at either 7 am and in 52 degree cold, damp and foggy weather, or at 11pm in cold and damp and foggy weather. So I plan to hit my bed hard soon. 1. I have many photos, many videos and many many stories to tell. They will trickle out over the next couple of weeks. 2. I didn’t plan to write a blog this evening, but I wanted to discuss one aspect of this weekend…the Empulse TTX. Not everything about the TTX, but an important detail. Still I am a fairly observant person…and I watch a lot. 1. Brammo had a production Empulse and took off a few bits (turn signals, tail light and bracket) and changed out the stock color for the race colors (still in light-weight carbon fiber). She was a production Empulse R just a week before Laguna Seca. A nice little video with James, the new Empulse Touring guy, going through the gears. He is going to do great as he loves this bike…and put about 700 miles on it before it got the TTX trim (so yes it is a ready to go, fully functional bike). 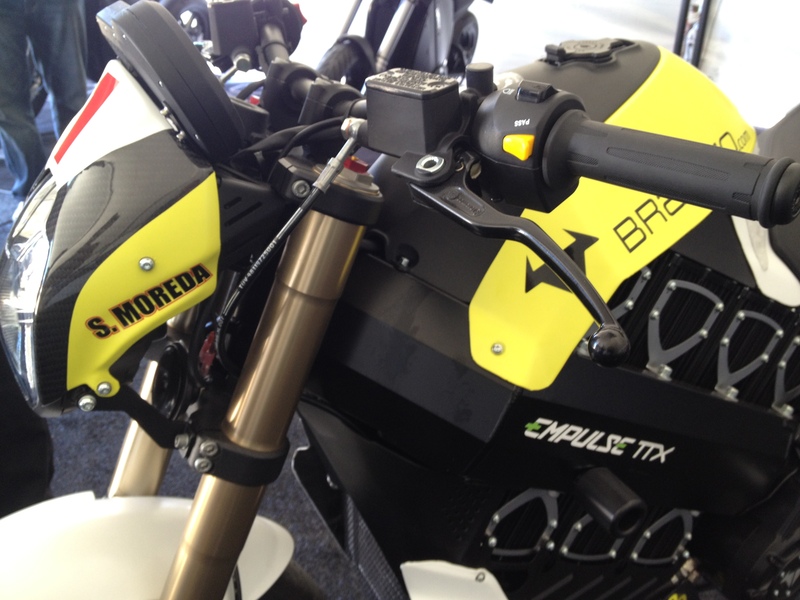 What we know: Brammo has a production bike in race dress that fits the TTXGP eSuperSport category. Brammo has a rider for that bike. And Brammo has a race team that can support that bike and rider. Which leaves us with actual production and sales. 25 units available for sale. Not sold. Not on the road. 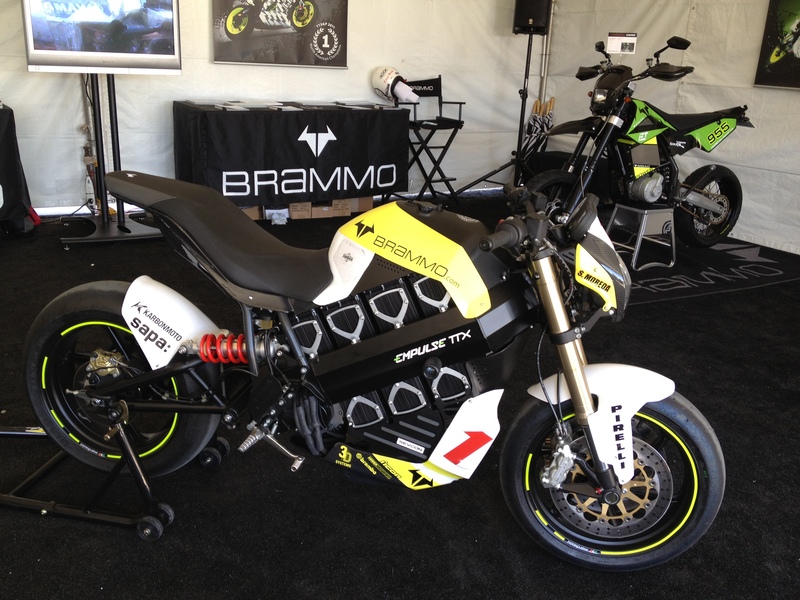 Brammo can have 25 units in their showroom in Ashland and race at Miller. Will they? I don’t know. But they say they are in production now. I imagine they will be working long long hours to get 25 bike built between now and the end of August. I do know the hurdle is just a bit lower than I previously thought. 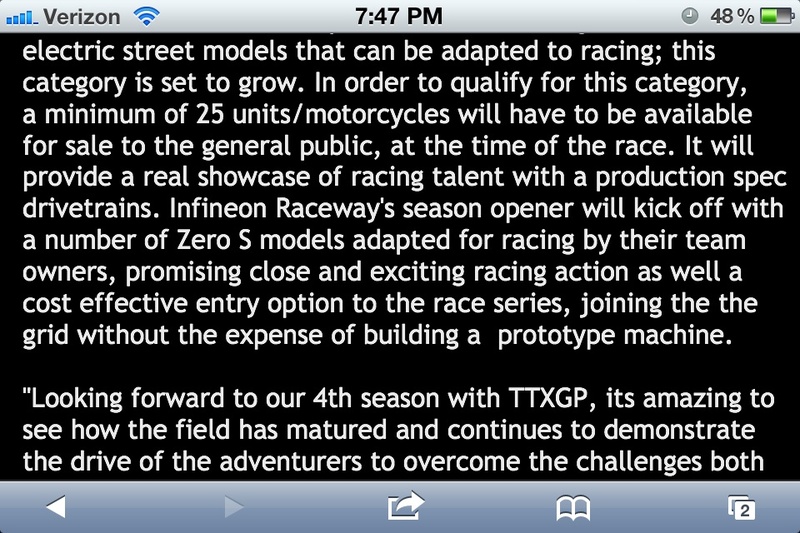 And I think Brammo will race 3 riders at Miller if they can. Till Next Time…bed calls with it’s siren song…. O.K. Now you have lost me with technical stuff but I am glad you are home. Thanks for the link Gavin! I was a little bummed that they didnt bring the Empulse TTX to Miller (or its rider for that matter)… hope to see it at Daytona though. So Im kinda jealous. You already got to ride the Empulse (albeit slowly), that makes you the first customer to ride the Empulse, and the first customer to ride the Enertia Plus (you sort of own one now really) That’s some special treatment! Brammo truly knows how to hook their biggest fans up!